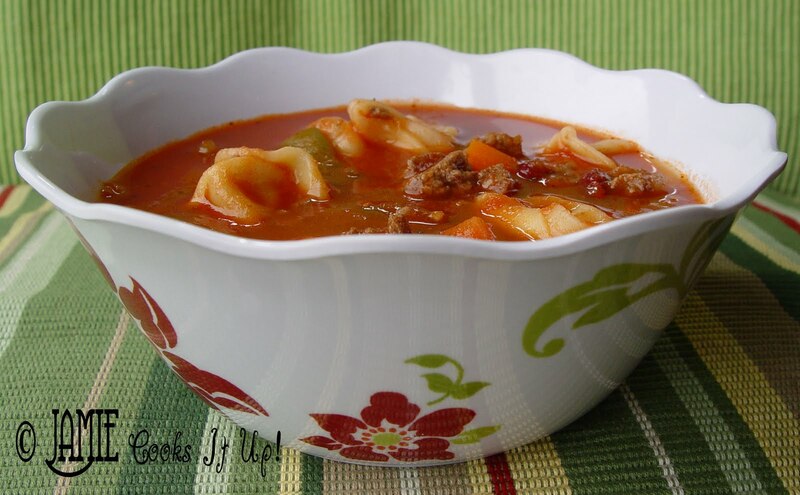 A little soul warming soup from JamieCooksItUp. It’s chuck full of veggies, flavorful, and my kids love it. Anything that my kids love AND is healthy is a keeper! It is wonderful served with my Macaroni Grill Bread, French Bread, or Quick and Easy Breadsticks. Recipe by Jamie Cooks It Up! 1. Brown your hamburger in a large skillet with the onion, garlic and a bit of salt and pepper. 2. Put the canned tomatoes in a blender and blend them up nice and lovely like. Just for 30 seconds or so. 3. Put the meat mixture, blended tomatoes and all other ingredients BUT THE TORTELLINI and TOMATO SOUP into a large soup pot. Bring it to a boil then reduce the heat and let the soup simmer for about 20 minutes. I like to leave the lid partially on. Less to clean up, and it keeps the heat some what trapped. 4. In a separate medium sized sauce pan cook the tortellini according to package directions. Be sure not to over cook it. When it’s done drain the water from the tortellini and add it to the large soup pot. 5. Stir in the tomato soup and let it simmer for just 5 more minutes. Let it keep you warm. 100 degrees along the Wasatch Front. I love soup recipes and this one looks delicious! Thanks for sharing! Jaime, this looks and sounds delish! Oh Yum! Definitely gonna try that one. Mmmmm….I love tortellini. And I love soup! It has been raining here for the last few days and this may be just the recipe to give the family a little warmth in their bones. At least we don't live in Upstate NY anymore. They got snow over the weekend! Yikes! Thanks for sharing! Ok, this looks sooooo good! I can't wait to try this! That looks delish! Love your blog! I made this recipe last night for dinner-everyone loved it (and we have 8 adults living at our house right now). Very easy-delicious topped with grated Parmesan cheese. 8 adults all giving the thumbs up! Hooray! Thanks for letting me know! We always put parmesan cheese on top as well. Have a great day! Thanks for sharing such a great recipe. I'm having a link party featuring soup. I would love it if you would link up. and who don't want a good soup like this? the person who say not is a big liar, or have a terrible sense about what is food, because a normal person jump into a restauran for one of this soup bowl. Have you ever tried this recipe in a crock pot? This soup can cook in the crock pot, without the pasta. I would recommend adding it just before you serve the soup. Good luck! This turned out FABULOUS!!!! I cooked it in a crock pot and added the tomato soup and pasta right before serving just as you suggested. I know what soup I'm bringing to our Harvest Festival!!! LOVED IT!!! Thank you soooooo so much for all the wonderful recipes. I love you Jamie!!! Yes, the soup freezes very well. I pour it into several quart sized ziploc freezer bags and then lay them flat in my freezer. They make a great lunch for my husband to grab on his way to work. Good luck! Glad you love the soup. I just wanted to say this is the first recipe I tried from your site. First of all I wanted to compliment you on your wonderful pictures. I'm a very visual person, I don't attempt a recipe unless it has a picture so I can see what the final outcome looks like. I love how you show your steps of the recipe through your pictures……Thank You! Now on to the recipe itself……it was a HUGE hit with my family. I didn't realize what a large amount this made, enough for plenty of 2nd servings and leftovers (my kind of meal)! This was also so hearty, that the soup itself is a complete meal! I love the variety of ingredients, it definitely was very savory!!!! Can't wait to try my next recipe from your site…..so much to choose from, they all look amazing!! Thank you for sharing your recipes with us!!!!!!! I just made this soup and it is very good. I will definitely make it again. I made a few changes to my liking. I used fresh italian sausage and that really gave it a good taste. I added fresh chopped chives and parmesan cheese once I had it in the bowl and ready to eat. Hi there I was wondering what kind of tomato soup you use? Do you use a condensed tomato soup, like from Campbell’s? Or just a regular canned tomato soup, like from Progresso? Thank you – I can’t wait to try it! Just a regular can of condensed soup, such as Campbell’s would work great. Good luck!